Now I know we all love a good Chex Mix, or any kind of "Muddy Buddy" you can find. There's nothing better than an addicting, crunchy, sweet treat to snack on, am I right? I have seen plenty of different varieties of Chex Mix, but since we can't have nuts in our house it limits it just a little bit. So a couple of weeks ago I decided to look on the backside of a good old Chex box and found this recipe. No nuts, only a few ingredients I already had in the pantry and some free time was all I needed. 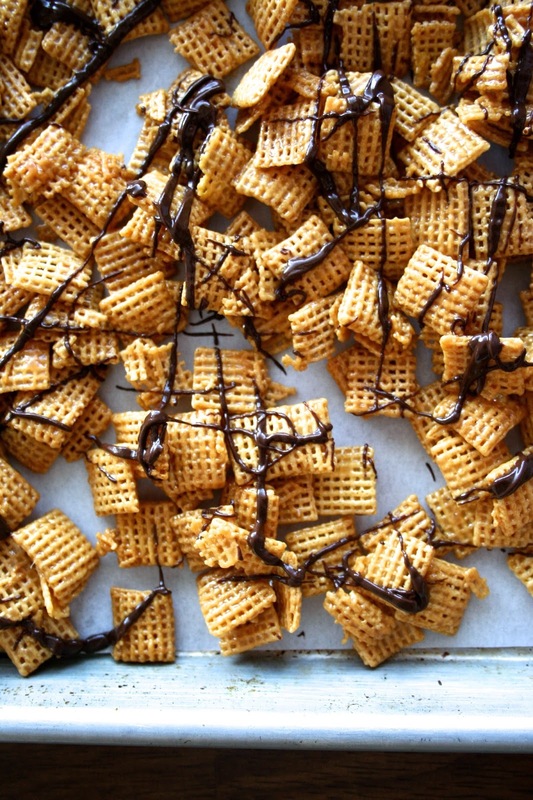 These Chex drizzles are sweet, crunchy, salty and completely addicting. As in, make sure you share or you will eat the entire batch in 30 minutes or less. All the recipe takes is a bit of microwaving and you have yourself a delicious treat in a matter of minutes. While I used semisweet chocolate chips like the recipe called for, I think these would be even better with milk chocolate chips. The semisweet were a little too bitter for me in this recipe. But either way, I still finished off the batch with no problem! 1. Pour cereal into a large microwavable bowl. 2. In medium microwavable bowl, microwave caramels, butter and milk uncovered on High 2 to 3 minutes, stirring after each minute, until caramels are melted and mixture is smooth. Pour over cereals; gently stir until evenly coated. 3. Microwave on High 3 to 4 minutes, stirring after each minute, until just beginning to brown. Spread on waxed paper to cool. 4. In small microwavable bowl, microwave chocolate chips uncovered on High about 1 minute or until chocolate can be stirred smooth. Drizzle over snack. Refrigerate until set. Store in airtight container. *For easy drizzling, spoon the melted chocolate into a small food-storage plastic bag. 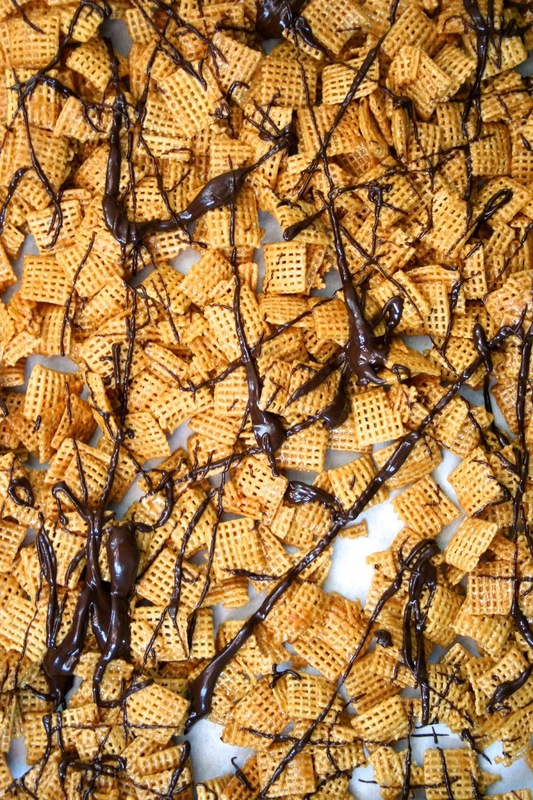 Snip off one tiny bottom corner and squeeze the chocolate over the cereal mixture. It's really addicting! Hunter is unfortunately. We found out when he was one. He's allergic to all nuts, which is not hard to avoid at home but is when we're out.